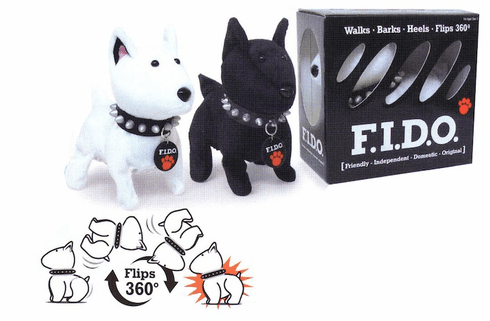 Home > Novelty Items > Novelty Figures and Plush > F.I.D.O. Man's best friend with attitude! F.I.D.O -- Friendly-Independent-Domestic-Original. You will flip over F.I.D.O. when this playful pup performs his amazing tricks for you. Watch him walk his walk, bark his bark, and do a complete back-flip somersault landing square on his feet!